Make your food order at your ease with our user friendly mobile apps available in Android and i Phone App. 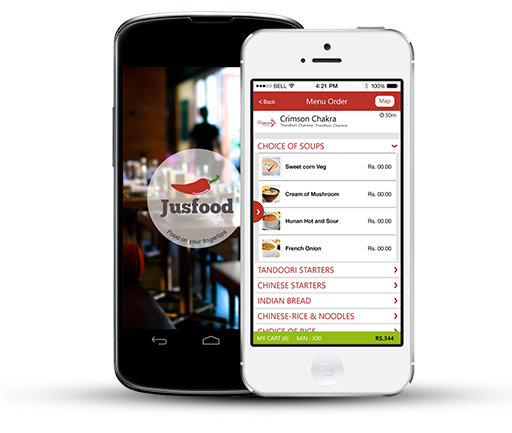 Jusfood mobile app also makes your online food ordering more fun with its timely offers and discounts. Jusfood massive apps that you can use to quickly and securely get your favourite food delivered to your doorstep with the help of your smartphone. New Delhi NCR & Chennai. home delivery, online payment and range of food cuisines to taste. Remember last time when you had close guest from Delhi, NCR, Chennai announcing their surprise visit to your sweet home. Which is then followed by sincere requests like let’s have the famous biryani of Chennai. While someone is asking to eat chole bhature from shree mithai or om corner in Delhi. God they blurted as if the prime purpose was to taste the food than to see the well being of you. Well we know its not like that they love to get pampered by you. Jusfood will help in making your quest for enjoying good lunch, dinner which is are home delivered all the more interesting and excited when you are scratching your head to entertain your guest with their demands met. There are two ways you can order food online with us. Download Jusfood app on your smartphone or open our user friendly website and get it home delivered. Or if you are busy in your schedule and just want to eat at leisure at home you can order takeaway from host of restaurants and pickup the food parcel kept ready for you while you are on the way to home. Well did I forgot to tell you something about offers and discounts you can get while you order using our mobile app just insert the valid discount codes sent to you and that’s it. Thank god it’s Friday evening…. Think of it and your mind start playing with different plans to enjoy your weekends. There are days when you are alone at house and you just want to spend a quality time with your hubby than spend hours in kitchen preparing food. Just want your lunch dinner home delivered from your favourite restaurant, in fact to savour the ever missing company you have been longing for. There are times when your body demands you to just leave everything and relax as it has been days since you had ordered your favourite breakfast from spoonbill in Chennai or tandoori dinner from motimahal deluxe or from any other favourite restaurant in Delhi NCR or Chennai. Celebrate birthdays, anniversaries or any auspicious occasion with your friends and family by ordering or gifting lunch and dinners to your loved ones by ordering food online from jusfood. Pamper your child studying in hostel by sending online cake delivery for his birthdays or to friends gifting them wedding cakes from the finest bakeries near you. Sweets are integral part of any Indian celebration, find desserts in Delhi and many other cities which deliver to you. Order authentic Indian desserts such as Halwa, Gulab Jamun or Kheer from famous places in your neighborhood. Shre mithai, ganga sweets in Chennai. Do you remember when you have given surprise to your parents living in Chennai or delhi with their favourite Thai, chettinad dish, chinese or north indian parantha with famous chicken biryani while you were away with your assignment abroad. Grab these moments as clock never ticks back. And jusfood will help you to make your parents, cousins and friends smile and remember you fondly. Gone are the days when you had to pick up the phone and list out all the items right from the roti’s nans, pickles, with all remarks like extra salad, extra chutney, no teekha and so on… Am I right and not to forget when you have a lame person sitting on other side listening to your order and asking you to repeat the order again and again. Now you don’t have to explain on phone that bhaiya pls no chilly in my gobi manchurian or use less oil. No more of these experiences. Simply enter in the special instruction and same shall be conveyed and followed. You will never get a yellow dal when you asked for dal tadkka. You will get your tandoori murg the way you had always wanted. Your nan will have no butter when you have always asked for plain nan. THAT’S WHY THEY SAY Don’t be on hold or in line, BE ONLINE. What are the choices of restaurants in jusfood. A list of restaurants is displayed that can deliver your food order to your home. You select as per your choice of restaurant from the list serving cuisines like Italian, Chinese dishes, Hyderabadi, North Indian, Burgers or Desserts like Ice-cream or Cakes. Once Restaurant is finalised then you browse the restaurants see its reviews, and then Menu. Click on the dishes you have been waiting to enjoy and they get added to the cart automatically. That’s all once everything is in order hit on the checkout and pays online or cash on delivery, choose the way you want we accept all major credit cards or pay cash on delivery. You can order food online in cities and areas like Chennai, Delhi and very soon in Mumbai, Bangalore and Pune.